Intel to release 10-Core Xeon Processors in First Half of 2011. 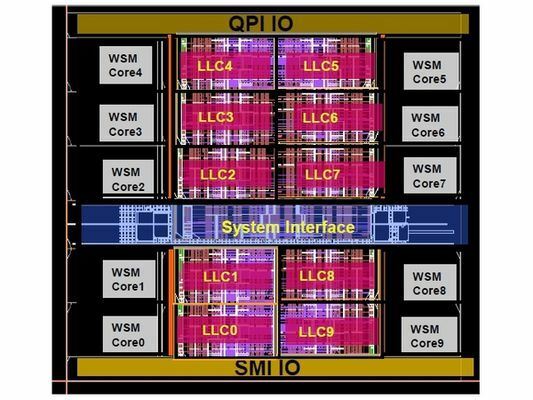 An Intel Spokesman has said that the upcoming 10 Core Westmere-EX” Xeon processor will be released and start shipping in the first half of 2011. The new CPU’s will replace the current Nehalem-EX CPU which were released in 2010 and consist of 8 CPU Cores. The new processors are built on a 32nm process while the older Nehalem CPU’s are built using a 45nm process. The Xeon CPU’s will also include additional security features to the table including Advanced Encryption Standard-New Instructions (AES-NI) for faster encryption and decryption of data. The new processors will target the High end servers which use eight sockets. This means that a total of 120 threads can be utilized because each of the CPU Core consists of two threads each hence (8 processors @ 20 threads each). Two socket systems running on the Westmere-EX CPU will also be capable of utilizing 2Tb of memory. The CPU’s will also include support with the older Nehalem-EX chips which will make it easy for buyers to upgrade the server processors.